Hummingbirds are fascinating to watch and great pollinators - so it's no surprise that they are one of the most popular backyard birds. 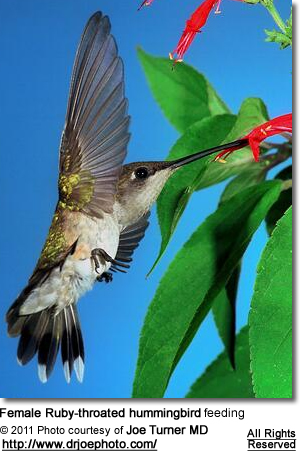 To attract hummingbird to your backyard attractive, plant pant red, tubular flowers that are native to your area. Alternatively or additionally, you can provide a regular supply of artificial nectar (sugar water). Hummingbirds love artificial hummingbird feeders, as they can provide the daily nectar equivalent of 2,000 to 5,000 flowers. However, since sugar water is not rich in nutrients, a variety of plants should also be available to them (scroll down for info). Place feeders in an open area at least 15 feet apart from each other. Hummingbirds don't like to feed close to houses or windows. You can attract hummingbirds to a new feeder by placing ripe fruit next to it, as this will attract gnats and other insects that hummingbirds also like to feed on. However, it is important to realize that dirty feeders and contaminated sugar water will make hummingbirds sick and potentially kill them. Bacteria and mold will grow quickly in sugar water. If you don't have time to sanitize a hummingbird feeder and provide fresh sugar water regularly (which could be EVERY DAY when the weather is hot and humid), it is better for the hummingbirds if you add some hummingbird plants to your garden to provide good nutrition and requiring little to no care. Please scroll down for info. 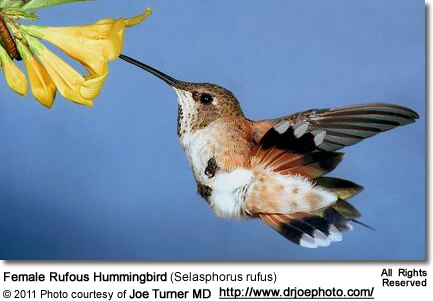 The diet of Hummingbirds requires an energy source (typically nectar) and a protein source (typically small insects). For nectar, hummingbirds will happily take artificial nectar from man-made feeders Such feeders allow people to observe and enjoy hummingbirds up-close while providing the hummingbirds with a reliable supply of nectar, especially when flower blossoms are less abundant.The feeders can be placed as high as 60 meters maximum. Since hummingbirds aggressively protect their favorite feeders, it is always a good idea to set up several feeders. Dissolve one part sugar in four parts boiled water to make it easier to dissolve the sugar and to purify the solution so that it will stay fresh longer. If bees are a problem at your hummingbird feeder, reduce the amount of sugar to a 5-to-1 ratio, which will reduce the interest of bees in the nectar. Never use honey, which ferments easily and spoils quickly and is, therefore, prone to culture a bacterium that is dangerous to hummingbirds. Never use artificial sweeteners, which are harmful chemicals. A hummingbird feeder should be easy to refill and clean. Prepared nectar can be refrigerated for 1 to 2 weeks before being used, but once placed outdoors it will only remain fresh for 2-4 days in hot weather or 4-6 days in moderate weather before turning cloudy or developing mold. Hummingbirds can be seriously harmed if they sip from a feeder with spoiled nectar. When changing the nectar, the feeder should be rinsed thoroughly with warm tap water, flushing the resevoir and ports to remove any contamination or sugar build-up. If dish soap is used, it needs extra rinsing so that no residue is left behind. The feeder can be soaked in dilute chlorine bleach if black specks of mold appear. A small glass bottle with a rubber stopper that fits snugly into the bottle's mouth; a narrow curved glass tube that is placed in a hole in the center of the rubber stopper; a red plastic tip with a small hole in the center of it that covers the end of the plastic tube. 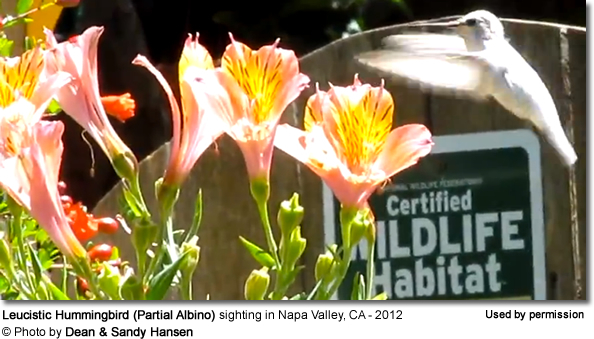 Other animals are also attracted to hummingbird feeders. It is a good idea to get a feeder that has very narrow ports, or ports with mesh-like "wasp guards", to prevent bees and wasps from getting inside where they get trapped. Orioles are known to drink from hummingbird feeders, sometimes tipping them and draining the liquid. If this becomes a problem, it is possible to buy feeders which are specifically designed to support their extra weight and which hummingbirds will use too. If ants find your hummingbird feeder, one solution is to install an "ant moat", which is available at specialty garden stores and online. Other non-toxic options to control ants, both in your garden and in your home. 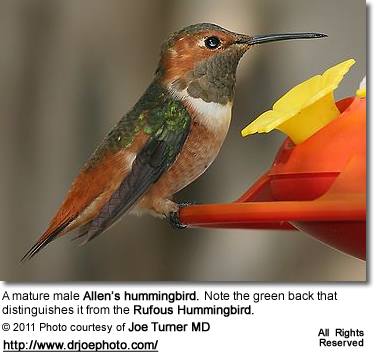 Note: If you are placing a hummingbird feeder out for the first time, or you don't see any hummingbirds visiting your feeder try placing it close to flowers where hummingbirds have been seen feeding. You can also tie 18 to 24 inch strips of red ribbon to the feeder. The blowing ribbons will make it easier for the hummingbirds to see. In areas where hummingbirds occur year-round, you can leave the hummingbird feeder up throughout the year. Hummingbirds learn to depend on them for their survival. If you are in a region, where hummingbirds migrate away from - leave the hummingbird feeders up for at least 2 weeks after you see the last hummingbird. The migration of some hummingbirds maybe delayed due to illness or injury, and they are in dire need of supplemented feedings when few natural flowers are still in bloom. Some suggest that leaving the feeders up will delay their migration thus putting them at risk of getting caught in cold weather. 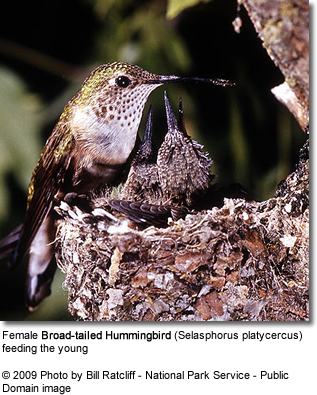 However, hummingbirds migrate in response to hormonal changes (triggered by decreasing daylight) - so whether or not a feeder is up won't impact their natural urge to migrate. In fact, they need the feeders even more before migration, as they need to fatten up so that they will survive the long journey. Hummingbird feeders increase their chances of surviving sub-freezing weather conditions. Once you take on the responsibility for feeding hummingbirds throughout the winter, when few natural resources are available to them, they are depending on you for their lives. The standard 4:1 syrup mixture will start freezing when temperatures go below 27° F; however, pointing a small floodlamp in a clamp-on reflector to the feeder will help prevent that. Do make sure that the lamp is at least a few feet from the feeder. 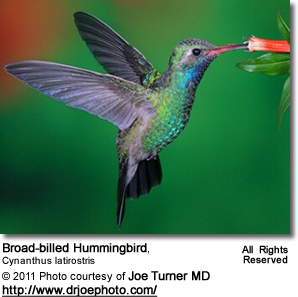 Hummingbirds sometimes become injured by household cats or other predators. Or they fly into garages and become trapped. Once inside, they may be unable to escape because their natural instinct when threatened or trapped is to fly upward. This is a life-threatening situation for hummingbirds, as they can become exhausted and die in a relatively short period of time, possibly as little as an hour. If a trapped hummingbird is within reach, it can often be caught gently and released outdoors. It will lie quietly in the space between cupped hands until released. Hummingbirds require a very specialized care and are difficult to keep alive by those with little to no experience with them. Therefore, the first thing to do is to contact a local Wildlife Rehabilitation Center for assistance. However, if you can't get the hummingbird to them straight away, you will need to take action to keep the hummingbird alive. Hummingbirds have a very high metabolism and get sick very quickly if they don't get food for several hours. You can provide them with a sugar-water mixture of 1 part sugar to 4 parts water (boiled water to kill bacteria and allowed to cool down to room temperature so that you don't burn the hummingbird's crop). This will tie them over until they can get to a trained wildlife rehabilitator who will then put the hummingbird on a balanced diet. Hummingbirds cannot survive long on sugar water or commercial nectar alone.